Each summer I try to make the most of summer break by learning something, doing special summer only activities and reading a few books. One of my teacher questions that comes up every year is student motivation. Why do some students excel and work hard and others give up before even trying? You’d maybe think it was the less skilled students who would freeze up and not want anyone to know about their lack of skill, right? In my experience it has actually been the opposite. Every year it is the seemingly really smart kid that refuses to work. The kid who tests well and comes from a super involved family. The one who clearly knows how to do the work or could with a little instruction and practice, but for some reason, just isn’t motivated. This kid gets under my skin every year. I’ve spent enough time in therapy to get why (I WAS that kid – my second grade teacher told my mom I “wasn’t living up to my potential” – *gulp*), so I’m super motivated to figure out their lack of motivation and follow through because I know how limiting this behavior can be. I also know telling someone they aren’t living up to their potential isn’t all that helpful. As in, not helpful at all. 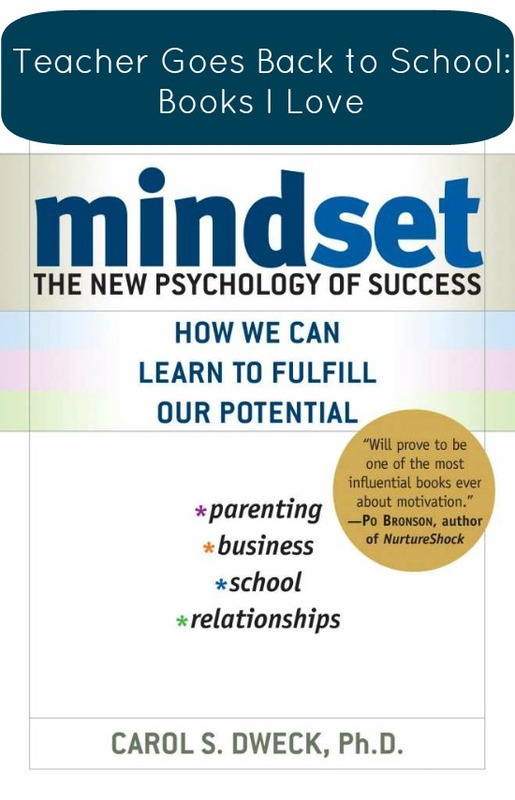 So when I ran across the book Mindset: The New Psychology of Success – How We Can Learn to Fulfill Our Potential by Carol Dweck, I was super interested in reading it. The author directly addresses the issue of student motivation that I’d been grappling with all these years. Check out this video from the Huffington Post with the author, Carol Dweck. In it she explains why praise is so harmful to student success and how to help students and their families move away from a fixed mindset which says intelligence is inherent and smart people shouldn’t need to work to a growth mindset which shows how the brain works like a muscle and can grow and change with challenge. This infographic explains the basics as well and can be found in this well-written post by Alex Vermeer. The title. I am very much in the thick of parenting and have a vested interest in student success so the title drew me in from the start. The author very quickly disclosed she began her life in a fixed mindset with limited success which helped me admit to myself I had as well. The author explained how her change in mindset from fixed to growth helped her do much more in her life than she ever thought possible. I’ve experienced a similar thing. My mentor teacher during my first year was ahead of her time. She absolutely knew that praise was not helpful to students and in order to get students motivated, a teacher/parent needs to praise the work/effort rather than the child or child’s intelligence. – Dweck’s research proves her point. This book helped me feel like I may be able to better work with my students who struggle with a fixed mindset. The brain research and the science behind the work makes it an easier sell to students and parents. This is another winner for me. Seriously, I can’t get enough. In fact, another teacher/coach and I have started a Facebook group to discuss this book further and how we can best apply the principles in our classrooms and with our own children. .Absolutely! I am completely fascinated with her work. I feel like I could learn so much from her. Absolutely. It isn’t just about student motivation. The is a lot of great information about relationships and business and parenting. In other words, there is something for everyone. Have you read Mindset? What did you think? Are you looking for other books to read? As part of my 43 Before 43, I tried to read 43 books. I made it all the way to 39 and only included books I liked, so if you are looking for something to read, please go take a look. The list varies quite a bit – from Harry Potter to yoga memoir and everything in between. This entry was posted in Books I Love, Life as a School Teacher and tagged Books I Love, Carol Dweck, do not praise student praise work and effort, fixed mindset, growth mindset, Mindset, student motivation by Teacher Goes Back to School. Bookmark the permalink. I’ve got this on my library reserve list and am anxiously waiting for it to come in. This makes me want to read it even more. Have you read Switch by Heath and Heath? I thoroughly enjoyed it!